Breaking things in Cass lab 201 happens on a nearly weekly basis for Gaston Merideth II ’18. The forensic science major said it’s all part of experimentation. 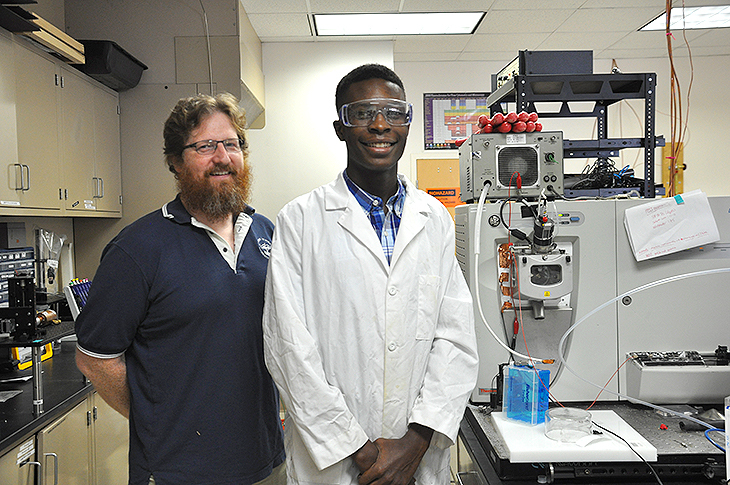 Gaston Merideth II ’18 has been working since his first year at UT with Kenyon Evans-Nguyen, associate professor of chemistry, on finding ways to analyze forensic evidence quickly while in the field. Merideth has been working since his first year at UT with Kenyon Evans-Nguyen, associate professor of chemistry, on finding ways to analyze forensic evidence quickly while in the field. Mass spectrometry is the most common technology used for forensic chemistry evidence analysis, however preparing samples for the mass spectrometer can be a long, arduous process. 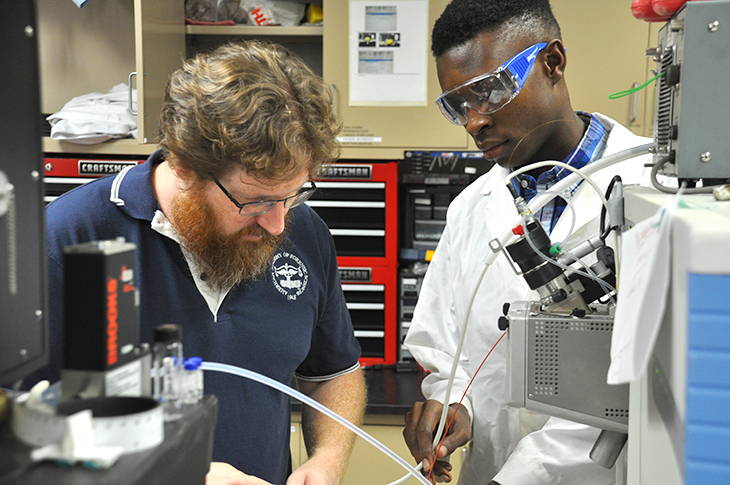 The samples that are fed into the mass spectrometer traditionally have to be processed in such a way that they form a clear liquid in order for the machine’s ion source (which is like a lens) to read the sample. Traditional methods involve a process similar to the following: Hunt around at the crime scene for items that can be sampled, take them back to the lab to rinse with solvents, filter and prepare them until they become a beautiful clear liquid that is then pumped into the mass spectrometer, which converts it to ions that are read by the scientists, confirming or negating the presence of whatever substance they were looking for at the crime scene, such as explosives residue, blood or drugs. In 2005, researchers started discovering ion sources that would read solid samples. While there are lots of other universities and companies working on ways to refine this process for organic materials, for applications in things like real-time medical results during surgeries or the next airport screening technique, Merideth and Evans-Nguyen are focused on ambient elemental analysis — using the mass spectrometer’s commercial ion source to read elements like zinc, copper and iron from solid or more opaque samples. Merideth wants to go into law enforcement when he graduates in December. He chose forensic science because he loves learning about science. He also thought it’d be good to have another career option if things didn’t work out with law enforcement. That being said, his research experience will serve him well in criminology. 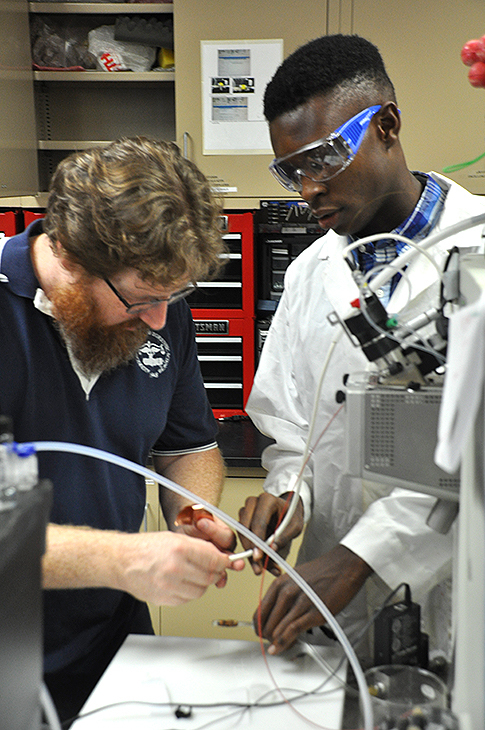 Merideth is finishing his last semester at UT training the next student to take his place in the lab. He’s changed since his first year in the lab and will be graduating with far more confidence than he started. That transformation is one of the best rewards for Evans-Nguyen. “After they’ve failed and failed and succeeded and seen how that works, those nuggets of success you get are remarkable. And once they taste that, it’s a huge boost to their confidence and it translates to everything,” he said, including employment after graduation.